Windows 8.1 introduced a variety of new Start Screen animations meant to give the OS’ flagship feature more jazz. However, for many users, those animations have led to a slow response time on the Start Screen to being downright annoying to some others. We’ll show you how to disable all animations in the Windows 8.1 Start Screen so you don’t have to deal with them anymore. While several animations were available in Windows 8, many more are available for users to try now. Depending on the way you color, customize and sort your Start Screen, a particular animation may work better than others. 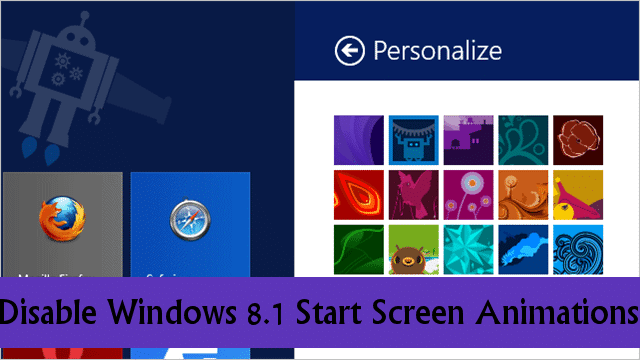 If you want to eliminate Start Screen animations all together, that option now exists in Windows 8.1. The above video gives you an idea of what the Start Screen animations do in Windows 8.1. As you can see, they’re pretty cool and go along with each personalization option and color schemes that come with them. We encourage you to check out each of the Start Screen animations for yourself, tinker with the colors on your PC and see what works for you before simply turning them off completely. Microsoft has confirmed on numerous occasions during the Windows 8.1 Pro Preview that it will be adding more animations, colors and Start Screen backgrounds in the future. Most of these will be animated, as the feature is pretty nifty with the right setup and color scheme. 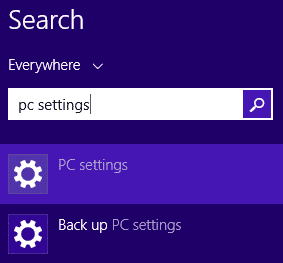 From the Windows 8.1 Start Screen, search for “PC Settings.” You can also opt to use any other method to open the PC Settings on your Windows 8.1 machine. Now, click on it. It’ll take a few seconds for PC Settings to open. Locate “Ease of Access” in the left hand menu and click on it. 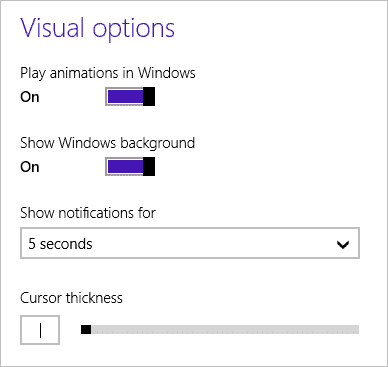 This will immediately turn off all Start Screen animations in Windows 8.1 for you. If you ever want to turn them back on, just follow these same steps and click the slider On. There’s no system restart required for you to disable or enable the Windows 8.1 Start Screen animations, so you’re good to go once you make a selection. Keep in mind that the Start Screen animations that go along with each type of setup were implemented for a reason. These animations may seem shallow, but they offer every Windows 8 and 8.1 user a chance to customize the Start Screen and put it to use the way it was meant to be utilized. If you prefer to boot to desktop to bypass the Start Screen and its contents completely, you’re missing out on all the ways you can make it your own. There are many programs out there that let users take more control of the Start Screen. There’s also programs out there that let them eliminate it completely. Remember that the Start Screen was added for a reason, so give it a try before you decide to bypass it completely for something more familiar, like Windows 7 and the Start Menu. Microsoft has thrown everything it can into making the Windows 8 and Windows 8.1 Start Screen the go to resource for users. Despite most users wanting to bypass the Start Screen completely, there is still some merit in turning it into something more than just a place to start apps, access programs and open documents. Windows 8 was meant to show users just what an interactive operating system could do. While many Windows 8 users have found it less than accommodating to their old OS ways, the Start Screen can be truly amazing if you take the time to learn how to use it. Start Screen animations, themes and color schemes can make it more functional for you. You just have to take the time to customize and start using it. Animations, customization options and more have turned the Start Screen into something more viable and personal for users, if only more users would give it a try. Have you given these changes a try? Comment and let us know! We’d love to see screenshots of your Start Screen and what you’ve done with it.